Are there used cameras or camera accessories such as DSLRs, mirrorless cameras (CSC) flashes, camcorders, or brand-name digital point and shoot cameras that are collecting dust at home? Think about trading them in with the London Drugs Trade in Trade up program! Simply bring in a gently used photographic device to any select London Drugs location and our LD Expert will evaluate the product and determine its value1. Credit will be then issued towards the purchase of a new camera or camera accessory. It's simple to keep harmful electronics out of landfills and earn some extra credit by participation in Trade in Trade up. How Trade in Trade up Works? 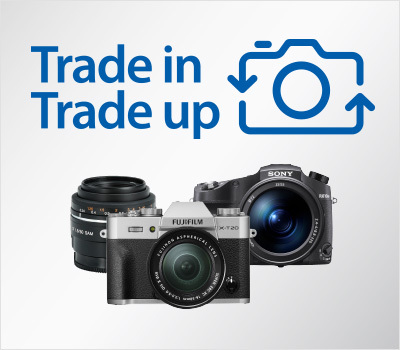 Trade-In Trade-Up excludes 110 film cameras, disc film cameras, select camcorders, and non-name brand flash units. Reformat your camera - By deleting all personal data and reformatting your device to factory default settings. Don't worry if you forget, our LD Photo Experts will ensure your device is reformatted after you trade-in. Don't forget to bring the original charging cables and accessories! – Although this is not mandatory, bringing everything in its most complete and original form will increase your trade-in value. Can I trade in more than one device at a time? Yes, as long as the total value of the trade in equipment doesn’t exceed the camera products you are buying. How long does the estimate last? The trade in value is valid on the day the trade-in is quoted only. If a customer refuses the quote then brings item back at a later date, a new estimation on the product will take place. Do I need to include the original packaging, instruction booklets, charger and accessories? It is preferred that you bring everything in its most complete and original form as this will increase your trade in value. Is it possible to get my old device back after I trade in? Do I have to sign an agreement with the Trade in and Trade up Program? Yes, you will sign the invoice of your new camera purchase accepting that you are trading in product. hat devices are eligible for the Trade in and Trade up Program? Currently, only photo equipment is eligible for the Trade in Trade up Program, this includes: digital point and shoot, DSLR and mirrorless cameras (DSLR/CSC), lenses, flashes, select camcorders and accessories. Photo equipment London Drugs does not accept for trade include: 110 film cameras, disc cameras, instant cameras, select camcorders, or non-name brand flash units. Please note that products brought in will be considered for trade but not all products will be eligible for trade in. How is the trade value determined? Our LD Photo Experts will determine the value of the equipment based on fair market value and the overall condition and completeness of your camera gear. Can I trade-in camera gear not purchased at London Drugs? Yes, the original purchase does not need to be made at London Drugs. 1. Products brought in for trade in will be considered, however not guaranteed for trade. Not all products will be eligible for trade in. London Drugs may consider a trade in when customer is purchasing any piece of photo equipment including: digital point and shoot, DSLR and interchangeable lens cameras (DSLR/CSC), lenses, flashes, and select camcorders and accessories. London Drugs does not accept 110 film cameras, disc film cameras, instant cameras, select camcorders, or no-name brand flash units for trade. 2. Trade ins are currently only available in select London Drugs locations. See link above for specific locations. Please note that Edmonton, Winnipeg, and Richmond – Ironwood Plaza store locations can accept trade ins but DO NOT sell them. 3. Due to Vancouver bylaws trade in equipment can’t be accepted between 6 pm and 6 am. 6. The trade in value is only good at the time of the quote. If quote is refused by the customer and brought back at a later date, a new evaluation on the product will be conducted. 7. The amount of devices being traded in cannot exceed the value of the new photographic equipment being purchased. **Refunds of new products, purchased with a trade in, will be accepted as per London Drug’s Return Policy. If item is refunded and trade in product has not been sold, the trade in product is returned to the customer. The value of the original trade in is deducted from the refund amount. The customer will receive the same net amount refunded as was paid. If, the trade in product had been sold, the value of the original trade in is credited to the customer for purchase of another camera product. London Drugs will not be giving cash back or gift cards to customers for their trade in product.